The Magic Bullet infomercial has a cult following unlike any other infomercial ever broadcast. 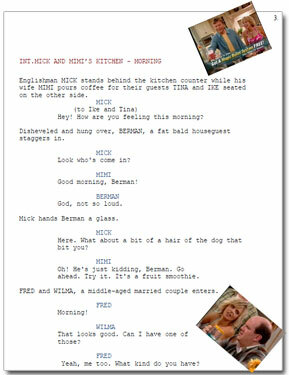 Much of its popularity comes from its very unusual (for an infomercial) format of using scripted dialogue and fictional characters. This same scripted format (as well as many of the same characters) are used in its sequels, the Magic Bullet to Go and the Bullet Express. Because of the Magic Bullet’s popularity and scripted format, there is a massive demand for these infomercials to be available in proper screenplay format. So today we make transcriptions of all three infomercials available to you. Now your local community theater or church drama group may perform these beloved dramas for the amusement and enjoyment of all. * For the sake of completeness, I have included the text of the voice overs used in the “commercial” segments. I advise, however, that you eliminate or at least greatly reduce these commercials in your performances. * As broadcast, the Bullet Express infomercial has three characters who go unnamed: Ralph’s wife and a couple consisting of a blonde woman and a bearded man. Following the penchant these infomercials show for naming their couples after famous ones (Ike and Tina, Fred and Wilma, Betty and Barney), I decided to name Ralph’s wife Alice and in keeping with the Honeymooners theme name the other couple Ed and Trixie. God, I love the Magic Bullet Trilogy. I would pay money to see these live on stage, especially the first two. The third one is okay, but it suffers from the conspicuous absence of Hazel and Berman, clearly the series’ breakout characters. If someone could stage these, it would almost make up for my inability to attend the stage spectacular that was Point Break Live! LMAO @ Magic Bullet Trilogy. Priceless. YAY! Right away I was thinking: I’m having a party and we’re filming a re-inactment! I LOVE THIS SERIES! THANKS! WOW! Wait until my local community theater gets a hold of these!